Student preparation for Class-X board Examinations - Ban on Printing and providing of Special Study material for the students. Not to print and provide study material to the class-X students, Not to use guides and study material, Ban on Using of Guides, Guide type Workbooks /Study Material, Readymade material/ Readymade answers, teacher notes etc... in TS Schools. Sub: RMSA, TS, Hyderabad - Student preparation for Class-X board Examinations - Ban on Printing and providing of Special Study material for the students - Orders issued - Reg. Ref: G.O.Ms.No.17, School Education (PE-Prog.II) Dept., Dt: 14.05.2014 and subsequent instructions from C&DSE, TS, Hyderabad. It is observed that certain DEOs are still preparing study material for the subjects, printed and provided to the students, which against the sprite of CCE methodology. 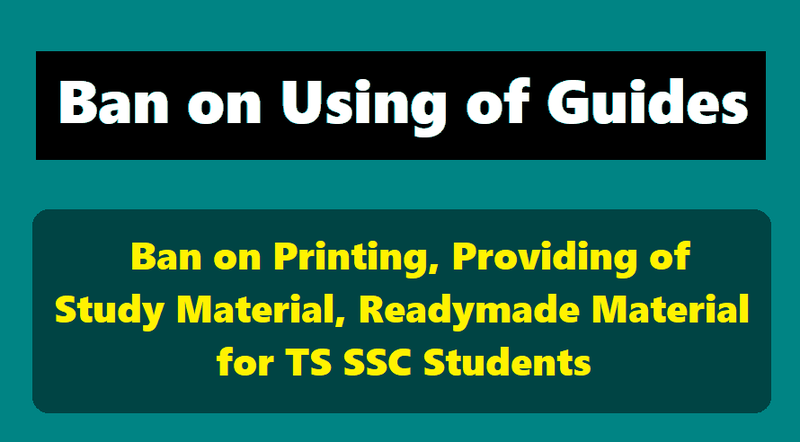 Ban on Using of Guides, Guide type Workbooks /Study Material in TS Schools: In this regard, it is to inform that as a part of improving the Educational Standards Govt. has issued orders vide reference cited banning the use of Guides and Study Material by the Children and Teachers. Readymade answers and memorizing them will damage the children's thinking capacities and self expression. Guides and Guide type Study Material shall not be used and all the HMs and District Educational Officers must copying the instructions issued in the G.O. read above. The instructions from O/o the C&DSE have also been issued on not to use guides and study material. The children has to read the text books and comprehend the concepts in a holistic way so that they can answer the questions of various type i.e., analytical, application oriented, reasoning, open ending etc. The focus is on understanding the concepts chapter wise with proper discussions in the class rooms encouraging for student questions during preparatory days i.e., February and March. The practice of making children sit in the class rooms / out sides of the class room and ask them to read and prepare for test will not yield result. During revision of the syllabus, the teacher has to explain the concepts of the unit and conduct slip test on the topic. The teacher shall again clarify the doubts based on individual performance on the slip test. Therefore, all the District Educational Officers are hereby directed to not to print and provide study material to the class-X students. This may also be taken to the notice of the District Collectors i.e., G.O.Ms.No. 17, vide ref. cited when they insist on the printing the study material or purchase of study material from the publishers. All our efforts are to do away with rote memory with readymade answers. When children prepare from study material the examinations pattern may not reflect the same and amounts to deviation of instructions.